We were thrilled to read a great article on stereotactic radiation therapy, another common term that is used interchangeably with stereotactic radiosurgery (SRS), in this month’s issue of Trends Magazine. 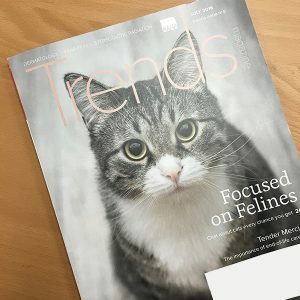 Trends is a premier monthly magazine published by The American Animal Hospital Association (AAHA) for veterinary professionals. It covers topics ranging from business and practice management to veterinary industry news. AAHA is the only organization that accredits veterinary practices throughout North America. Accredited hospitals, including Care Center, our partner center in Cincinnati, Ohio, have met AAHA’s stringent quality standards. The article on stereotactic radiation therapy (SRT) is titled, “High-Tech Therapy in Studio,” and appears in the Tech Support section of the magazine. The article discusses what SRS and SRT are, points out their advantages, and explains how the technology works, among other details. 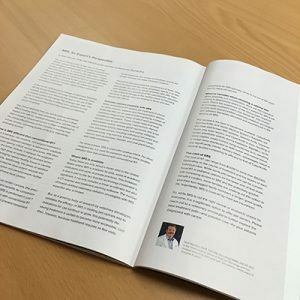 Included in this section is a supplementary article, “SRS: An Expert’s Perspective,” by PetCure Oncology’s Chief Medical Officer Neal Mauldin, a triple-board certified veterinary specialist with certifications in radiation oncology, medical oncology and internal medicine. Dr. Mauldin is one of the most experienced and reputable veterinary radiation oncologists in the world, having treated more than 1,500 pets with SRS in the past six years. His article covers the differences between SRS and conventional radiation therapy, common cancers treatable with SRS, where it is available as a treatment option, what veterinarians should consider when choosing a referral site, and the cost. In both articles, it is evident that SRS and SRT mark a new frontier in radiation therapy and cancer care for pets. If you subscribe to Trends, you can read the digital edition of the July issue on AAHA’s Trends Archive page. If you would like to subscribe, please click here. Have questions about SRS? Contact us. If your pet has been diagnosed with cancer and you would like to know if SRS might be an option for your pet, please contact a PetCure Oncology location near you to schedule a consultation.